Vancouver First Aid proudly features food safety certification courses at both the Surrey and Vancouver Training centers. This course meets BC Health Act requirements for food safety certification. To register for a course scroll to the bottom of the page. We offer this course at our main training facilities in Vancouver at 1773 Kingsway and 1020 Mainland Street in down town. We also offer this program at our training facility in Surrey at 7238 137st. For more information about the amenities and free parking available at these locations check out our locations page from the main menu. 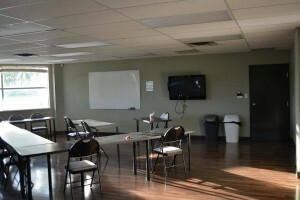 Our Food Safe Classrooms in Vancouver, B.C. The cost of this food safe level 1 course is 75 dollars. This course fee includes manual, certification and taxes. This course teaches individuals about worker safety, prevention of food-borne illness, how to properly store, receive and prepare food. Candidates will also learn about proper methods in serving, sanitizing and cleaning food. The concepts covered in this course will teach you to stay safe, healthy and keep customers and clients safe and healthy. Main topics include proper food cooking and serving temperature as well as the appropriate storing temperatures. Another major component of this course is the health and safety of customers and employees. Participants will also learn to why and how to sanitize dish-wares and serving equipment properly. Candidates will need to complete a test at the end of the course and receive a minimum grade of 75% to pass the program. The certification provided through this course meets BC Health Act regulations and requirements. This certification is required for employees and managers that work in the food service industry in British Columbia. Certification provided expires after 5 years. The length of Food Safe level 1 is 8 hours. Candidates must attend 100% of the course to successfully complete the program. We do not accept refunds or transfer within 72 hours of the course. Prior to this time candidates can receive a full refund or transfer to the course of their choosing. At Vancouver First Aid we have a “no pressure” policy. If you do not complete the course the first time (must attend 100% of course) you can re-take the course at no extra cost.